The aim of the new Database Recovery Advisor in SQL Server 2012 is to simplify the task of piecing together a recovery sequence from multiple backup files, comprising full, differential, and log backups. In this article, I’ll demonstrate how the tool makes it easier to plan for, and perform, a point in time recovery from a series of backups, in order to recover data that may have been lost due to an application bug, or user error. 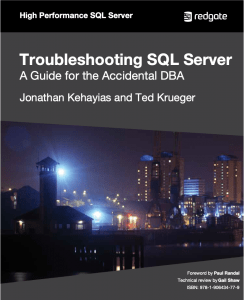 Occasionally, a DBA may need to restore a database from a multiple backup files that originated from multiple servers. This requirement might arise, for example, in a database-mirroring configuration, where backups may be from either of the servers. Learn the basics of Event Notifications from MVP Jonathan Kehayia. This article will show you how to create customized responses to events in SQL Server 2005/2008. Learn how to create a certificate signed stored procedure to solve common permissions problems using sp_send_dbmail. MVP Jonathan Kehayias brings us a short tutorial that discusses your options and code to show you how to implement certificate security. Learn how to minimize downtime while moving databases using Backup/Restore in SQL Server. Moving Database Files Detach/Attach or ALTER DATABASE? Learn why ALTER DATABASE should be preferred over Detach/Attach for moving database files on the same SQL Server from MVP Jonathan Kehayias.